At Stryve, we’re all about agile marketing. It’s the only way to thrive in a digital world. The waterfall mindset in marketing is dead. Digital requires you to move seamlessly between the creativity of social interaction to the science of conversion optimization and analytics. And it requires a massive mind shift to do so. But how do you transform your team into an agile marketing powerhouse? Our experience has taught us it’s an incremental process. One that requires a simple approach to getting started. These four steps will get your team started in no time. Run an info session on agile marketing. Start with the Agile Marketing Manifesto. If your team gets on board with this, you’re well on your way. Read Hacking Marketing by Scott Brinker. Then blog about it, like we did. Then do a working session discussing the key elements of the book. It’s the best book on agile marketing on the market. Know it cold. If your team doesn’t understand agile, you’ll never get them on board. You need them to understand the HOW and WHY of agile. Kanban is a process for visualizing workflows originally developed by Toyota. It then extended into software development. Now it’s becoming the standard for digital marketing teams. There are plenty of Kanban platforms. We’re big fans of Jira. If you’re cost-conscious, go with Trello. We don’t feel comfortable recommending anything else. Before you can start your agile marketing, set up a kanban board. Below is an example of Stryve’s Trello board. This one is pretty simple. Typically for more complex projects, we’ll use Done, Working On This Week, In Review, In Queue and Backlog as our headers. But there are a variety of approaches. You can also find more examples here. Don’t implement an agile marketing system across the board right away. Start with a small pilot with some basic agile principles. Don’t worry about perfect execution. Start with the fundamentals and get familiarized with them. Here’s how to run a quick pilot. Do the basics. 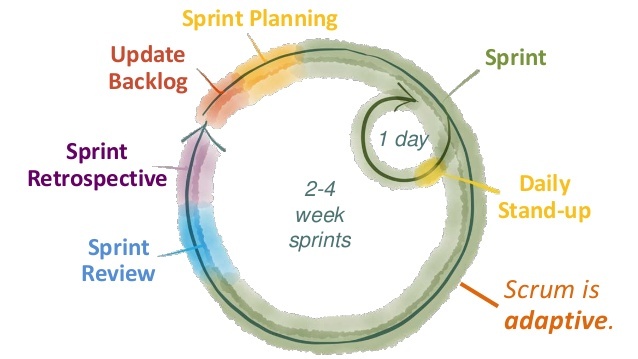 Pull together a scrum, plan and run a sprint, run a retrospective, optimize and run again. Too many agile marketing teams aim for perfection from the get-go. It’s more important to get a feel for how agile works, then optimize over time. Seasoned agile marketers will find a lot of gaps in using these few metrics. But we need to keep things simple to start. Over time you can layer on metrics and make connections. For now, let’s stay with the basics. Experts in digital tend to overwhelm their audience. Whether it be clients, colleagues, or conference attendees, there’s a tendency to communicate about the edges of innovation. We talk about glorious end states, where everything is measured, personalized and targeted. Where you can respond to any opportunity at any time. But the reality is that most marketing teams need to evolve over time. And to do that, you need to keep it simple to start. Agile is a process, not an end state. It’s an approach. And the best approaches are simple. So get started, keep it simple, get better over time. Before you know it you’ll be running an agile marketing powerhouse. Ryan is the Co-Founder and Manager Director of Stryve. As an entrepreneur, he is prone to bouts of incredible optimism and setting unrealistic expectations for his team.